Identify revenue leakage and uncover revenue potential. C-level executives often ask if there is any additional revenue potential that they’re not exploiting. We can help to discover it. Based on past sales data (invoices or billing logs are enough) we can detect areas of revenue leakage and uncover room for significant improvement. 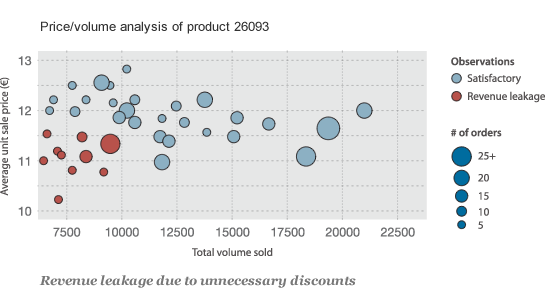 For example, we can detect excessive discounts on certain products/services, identify sales that were too conservative (or too aggressive) and find products or services with high revenue potential. Our approach is based on state-of-the-art mathematical models and optimization techniques. It provides new possibilities for detecting and eradicating the root causes of revenue leakage and can significantly improve the bottom line. The revenue potential health check is offered as a service; just once or recurring at specified intervals (e.g. every month) if required. It is a very high value-added service, yet at a very competitive cost with a quick time-to-value. Depending on the outcome of the revenue potential health check, we can also offer PriceLenz to help your business optimize its marketing and sales functions.